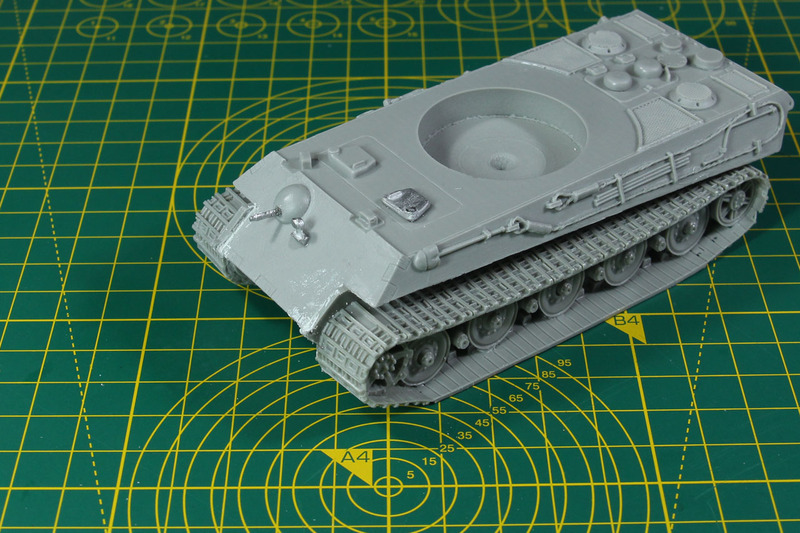 Another iconic tank from the late war period is the PzKpfw VI Tiger II, in this review we're looking at the resin kit by Warlord Games picturing the Ausf. B without Zimmerit and a Henschel turret. 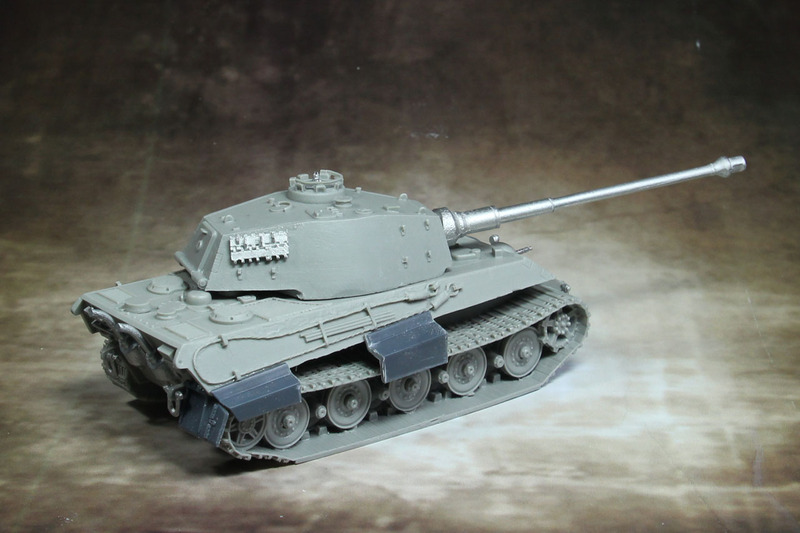 The Tiger II, also known as King Tiger or Royal Tiger, was the derivate of the Tiger I, and combined the thick armour of the predecessor and the sloped armour of the Panther medium tank. The pattern was the pinnacle of German tank development and production, and after initial problems with reliability it proved to be a remarkable battle tank. The Tiger II first saw service in summer of 1944, at the Invasion of Normandy by the Allies, and was issued to the Wehrmacht as well as to the Waffen-SS heavy tank battalions. A total number of just below 500 units was produced until March '45, of these the first 50 were issued with the Porsche turret due to bottlenecks in production of the Henschel turret. 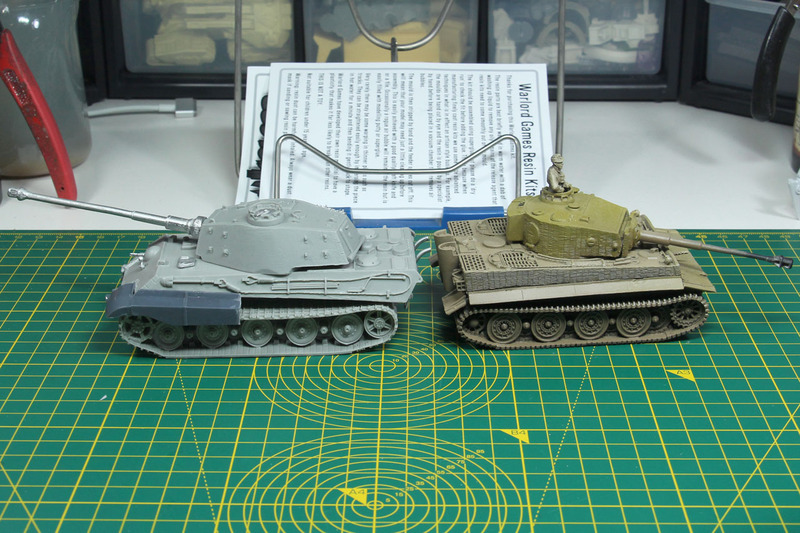 In the first months of the productions, both variants of the Tiger (I and II) were build simultaneously. 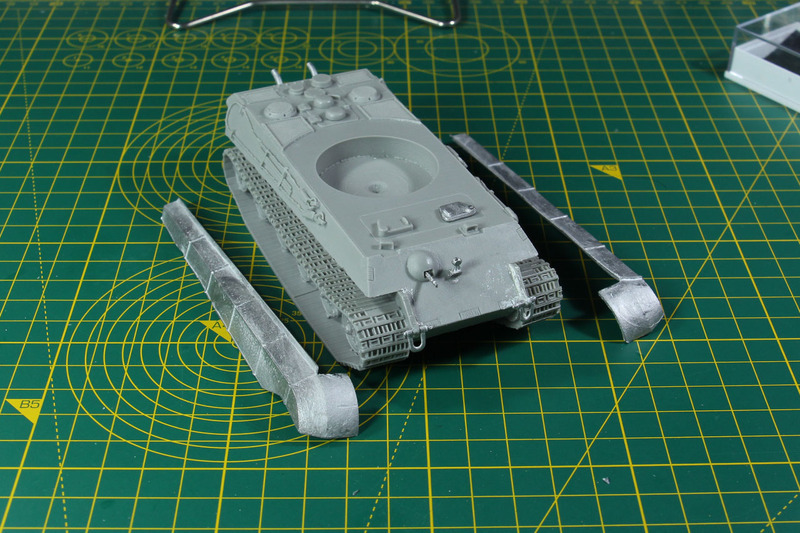 The internal designation of the Tiger II is Sd.Kfz. 182 and it was armed with 8.8 cm KwK 43 L/71 anti-tank cannon. The Tiger II used the same Maybach petrol engine as the Panther did, which caused the heavy tank to be underpowered, like many similar classified tanks from World War two were. This lead to a very high fuel consumption and high wear and tear on the transmission. For that reason, many of the Tiger II tank that were damaged or destroyed in the war, weren't necessarily kills, but were given up and / or destroyed by their crews after running out of fuel or broke down. 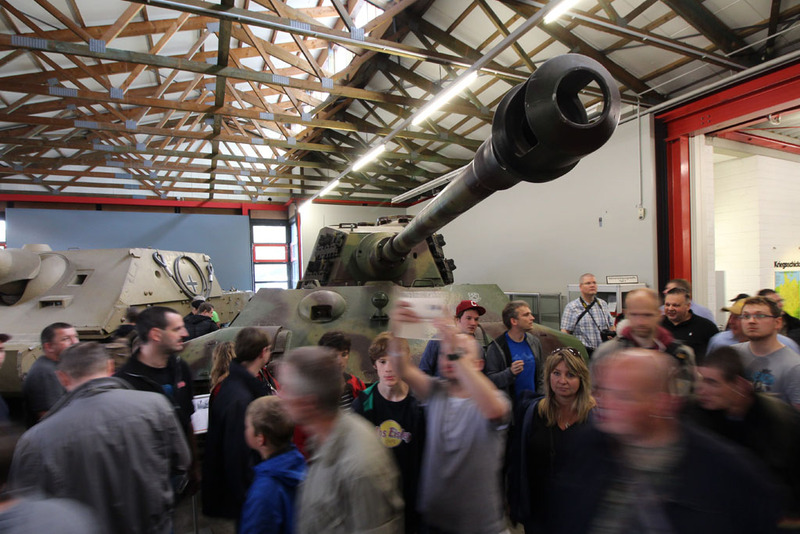 There is only one working example of the Tiger II around and it can be seen in the tank museum of Saumur. 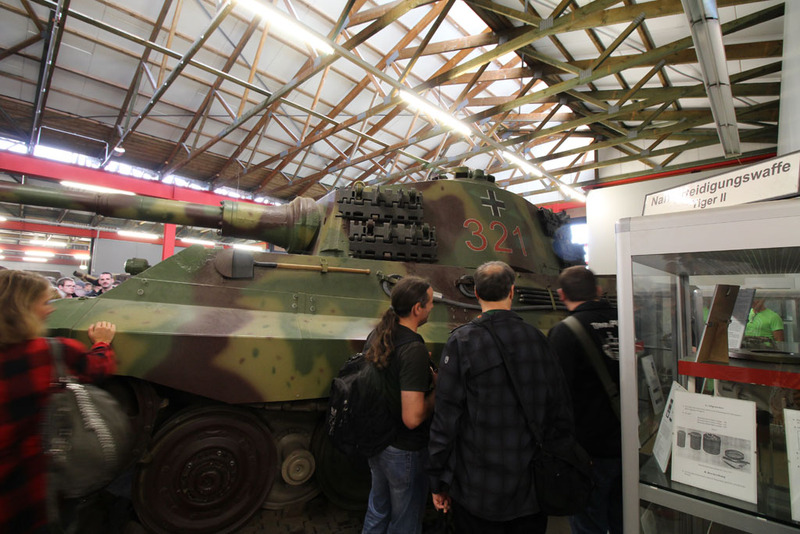 Other surviving vehicles (non-functional) are exhibit among other locations at Bovington, Kubinka, Fort Benning and Munster. 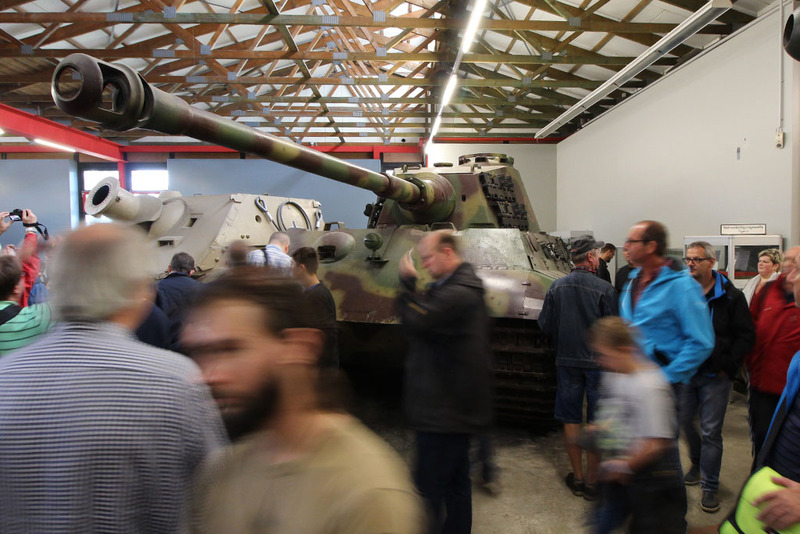 I had the chance to see one Tiger II, in the same load out like the kit, on the rather crowded Stahl auf der Heide 2016 event at Tank Museum Munster. 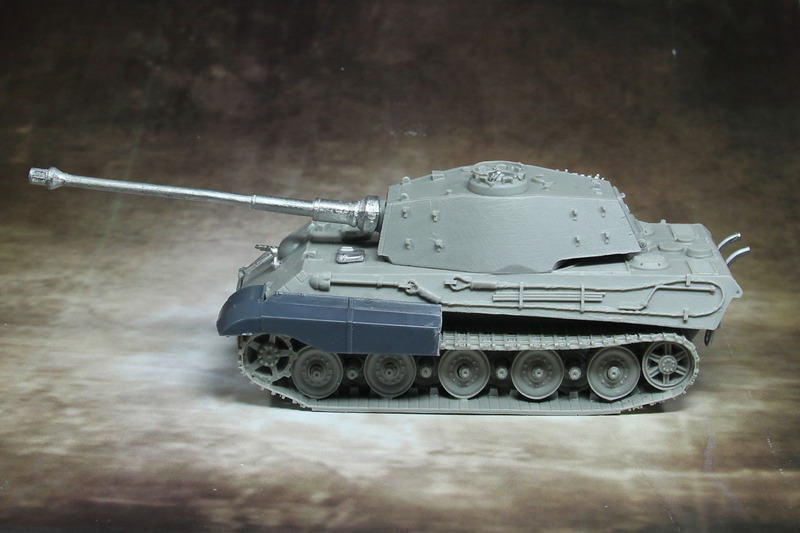 The kit that is shown in this review is a resin and metal hybrid kit by Warlord Games. 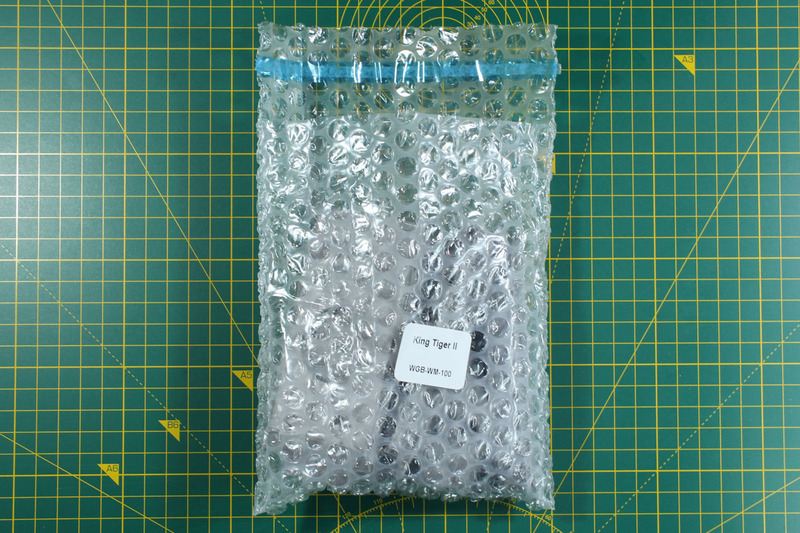 It is a made-to-order product and is as such delivered in a bubble wrap bag without box or decals. 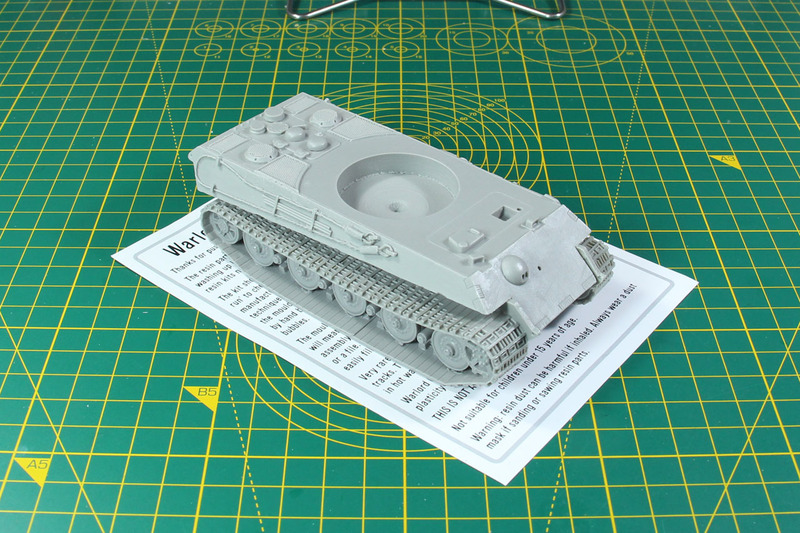 This specific Tiger kit was ordered last July during Historicon 2017 as part of the Kurt Knispel bundle (you got tank ace Kurt Knispel in a bundle with different tank kits). Customer service was kind enough to exchange the Zimmerit variant of the kit with the "regular" before delivery, after a short email exchange. 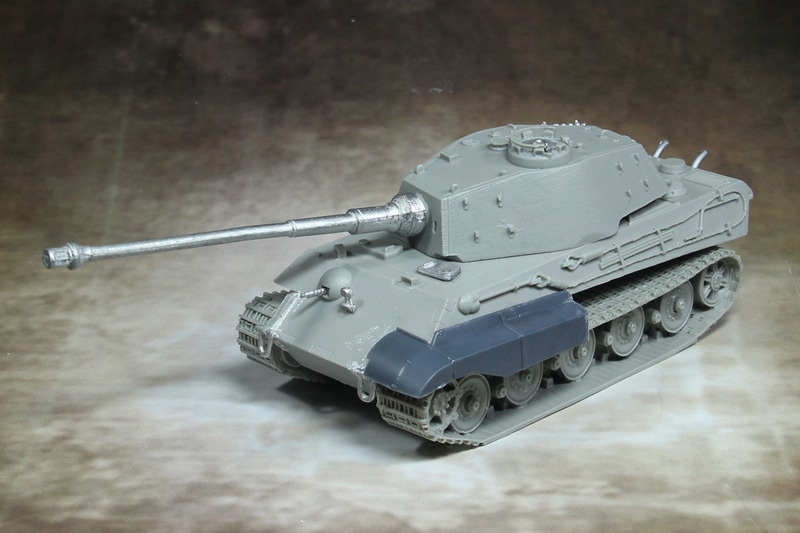 Warlord Games sets the price tag at 28 GBP for the 28mm / 1:56 scale kit. 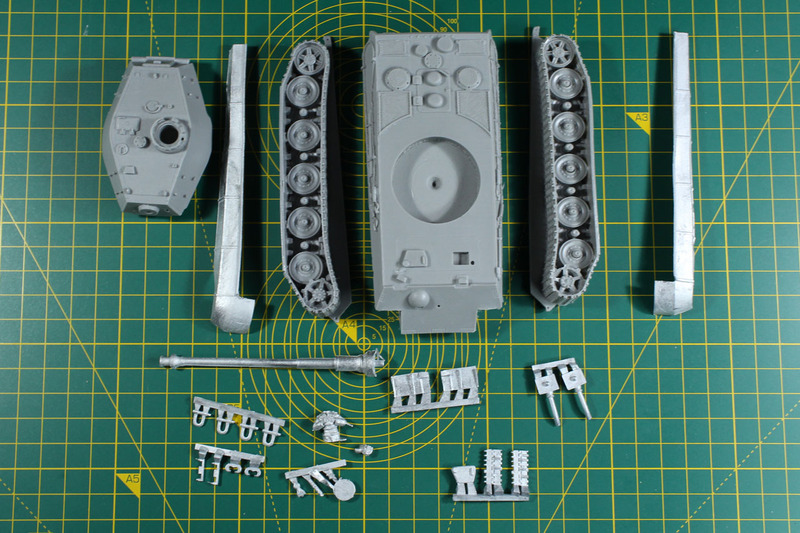 It comes with a hull, tracks and turret made from resin and further detailing parts in metal, among others the gun, exhausts and track guards. 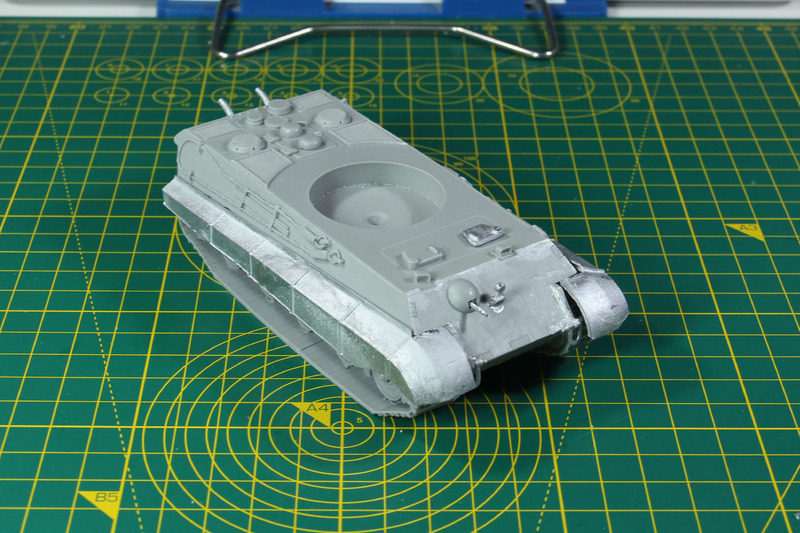 The resin parts were cleaned with some lukewarm soap water before hand and the tracks had a slight warp that was taken care with hot water to straighten / align the pieces with the hull. After the tracks were superglued to the hull - no need for pinning there as the surface area is large enough for the glue to bond - the small detail parts for the front are added. 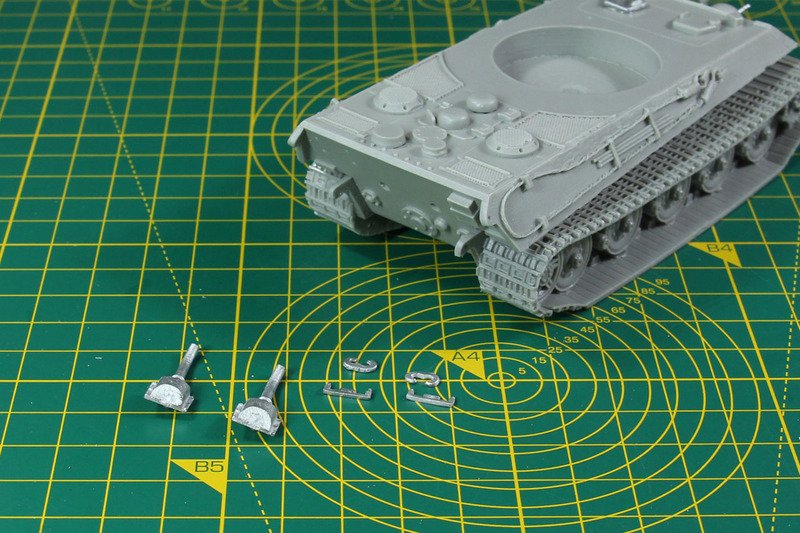 These are in detail the central head light and the hull machine gun, as well as the drivers hatch. This one can be build either closed or open, if you want to add a driver to that position. Next up the first batch of the rear details are added. The exhaust pipes along with the towing hooks and their holders. 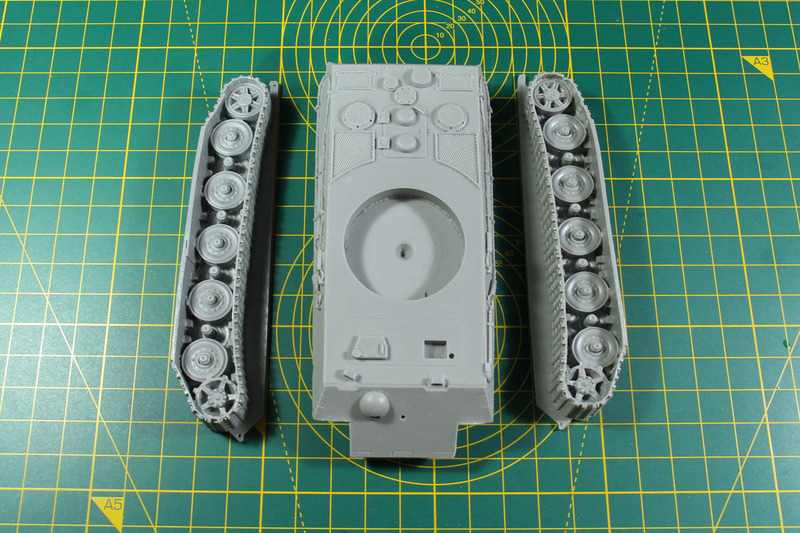 These can be left off and only the holders added, if you want to, as this can be seen on many images of King Tigers in action. The towing hooks in the front and back are added. These are casted as complete pieces, so you can either drill the resin and move the bolt through it or cut out the bolt and glue the u-shaped hook to the hull. If you press the sides a bit together the fit is quite tight and no hassle to mount. Compared to the plastic kit, this one is missing two of the hooks, so the upper back hinges are left without them. 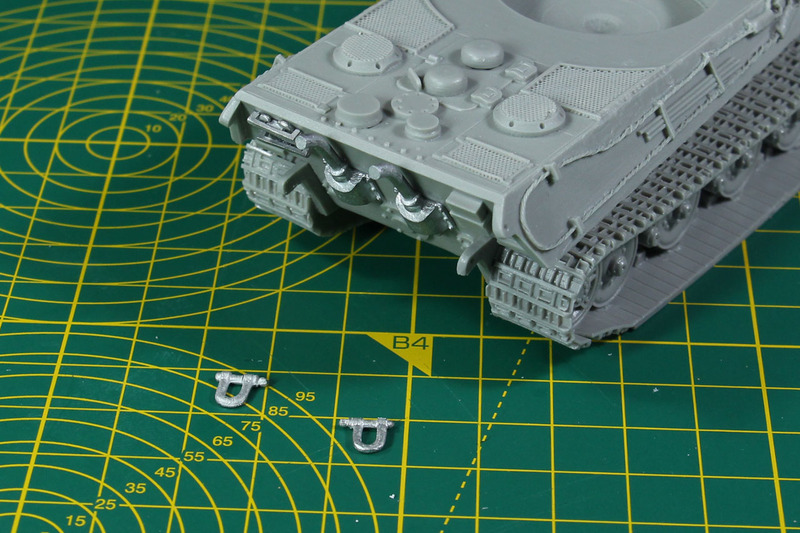 Final and optional parts of the hull are the track guards. Those are two pieces on each side, with the single long piece of side and front guard combined and the back part of the track guards. 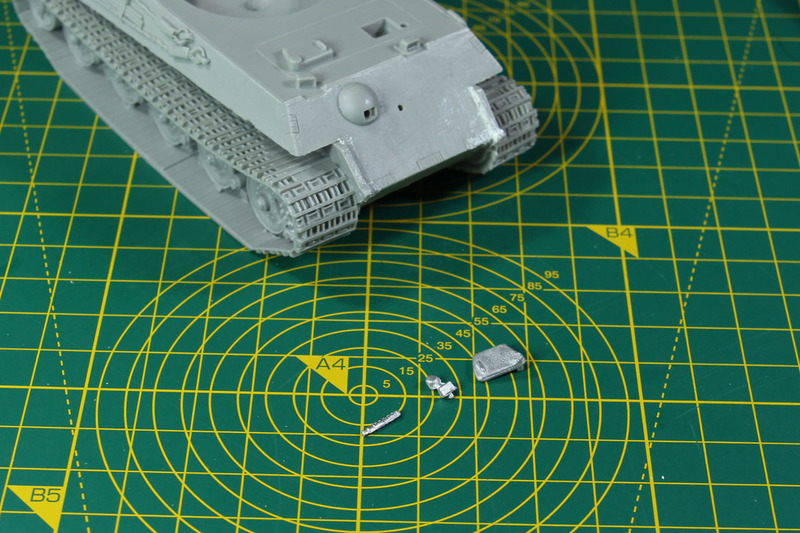 You could cut the metal into pieces to show a battle worn track guard, but I went with the left overs of the guards from the Italeri / Warlord Tiger II kit. And now for the turret. It is the boxier Henschel turret with the 8,8 cm cannon. 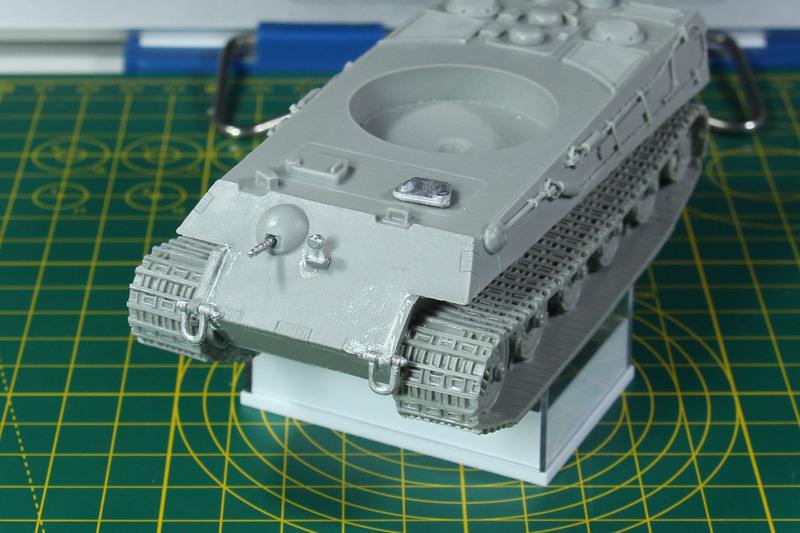 There are optional tracks for the turret (usually mounted to the side), but only "two". 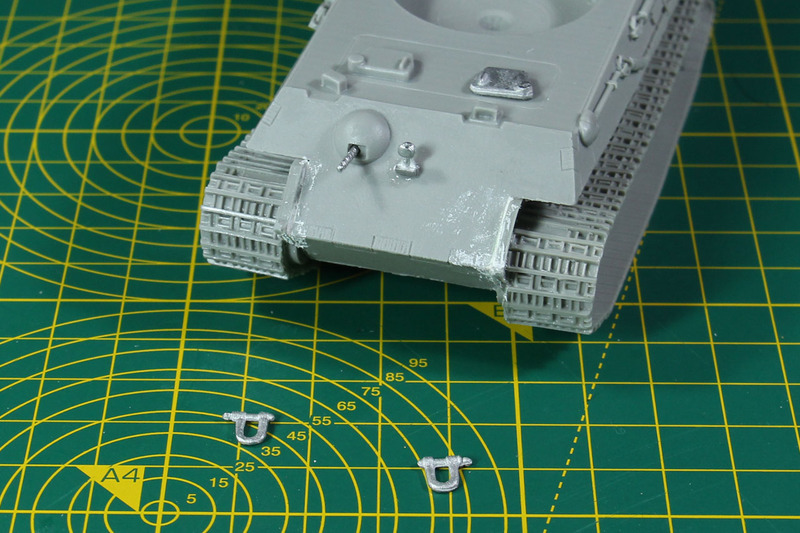 If you want to glue the tracks to the side, it makes sense to cut down the holders a bit for a closer fit to the turret. 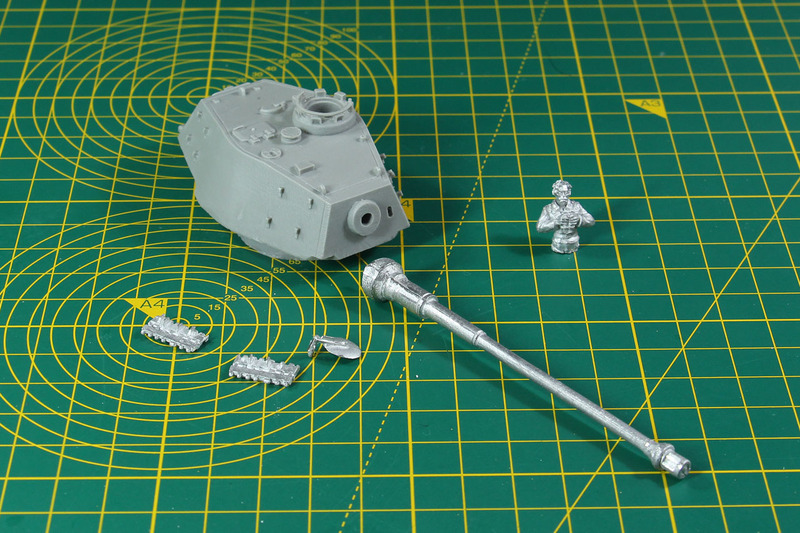 The tank cupola can be build closed or open, with an optional tank commander miniature. There is no turret machine gun with this kit. 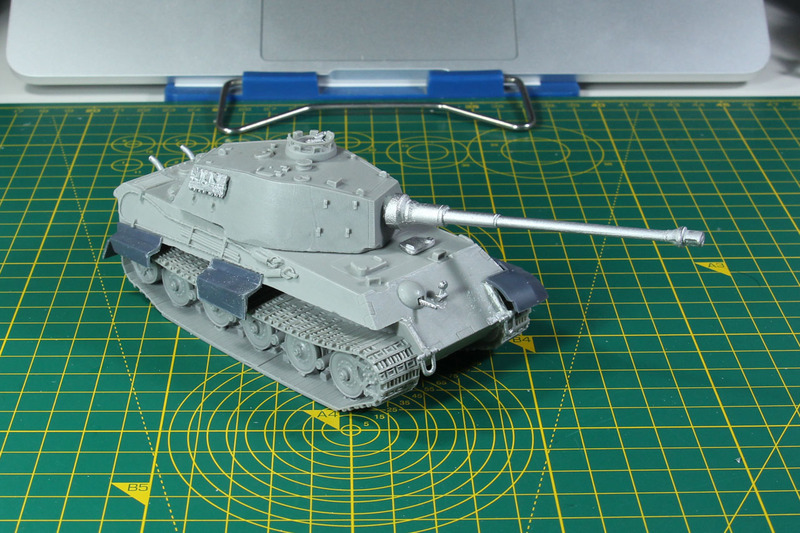 As for comparison with the predecessor, Tiger I. You can see the less boxy design and angled armour plates. 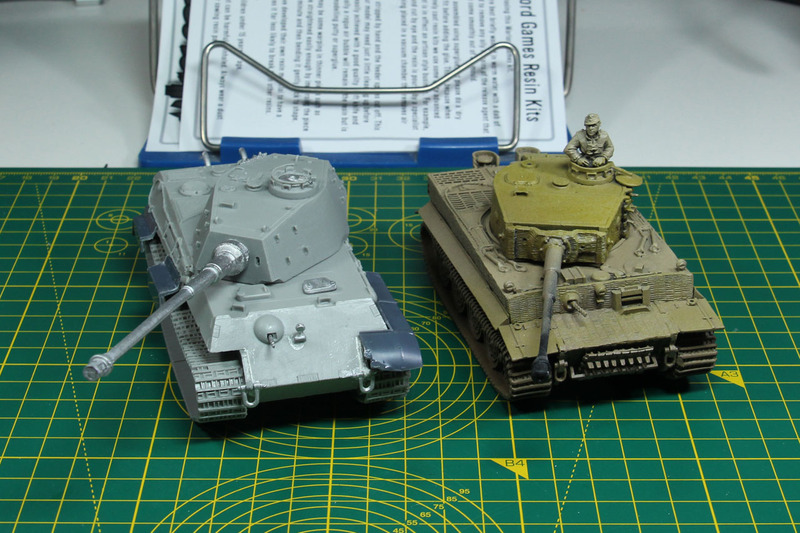 Heights and width is roughly the same, but the Tiger II Ausf. B comes at a greater length. And of course, a few different angels from the final build tank, with battle worn side tracks of the plastic kit. 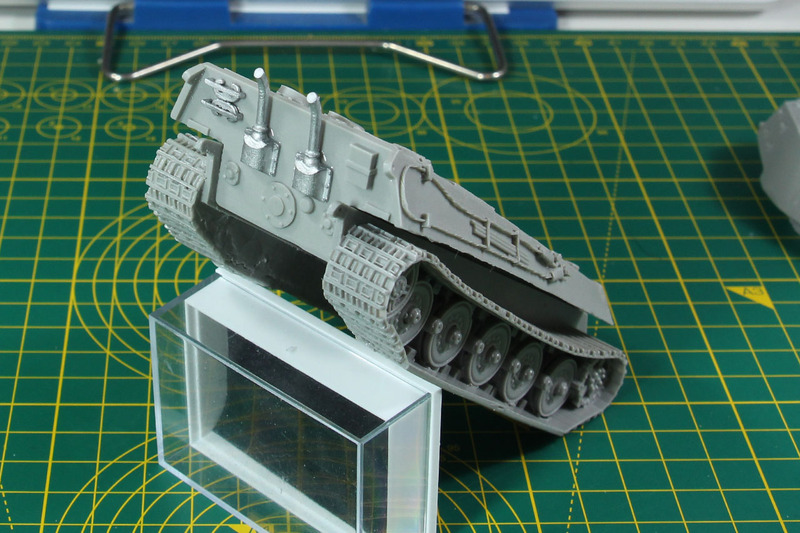 The build of this resin kit is pretty straight forward. Easy to handle and after I took care of the slightly warped tracks, it went on without much of a hassle. Side note on bending resin parts, I poured almost cooking hot water (almost not really cooking) on the tracks and it made the alignment so much easier. Went with ~60° C water in past and that seems just too cold to get a proper realignment. The right temperature might vary from resin to resin, so it is best if you test it before with a not needed piece of casting. 28 GBP is not cheap, but you get one of the biggest and heaviest tanks for that money on the table. 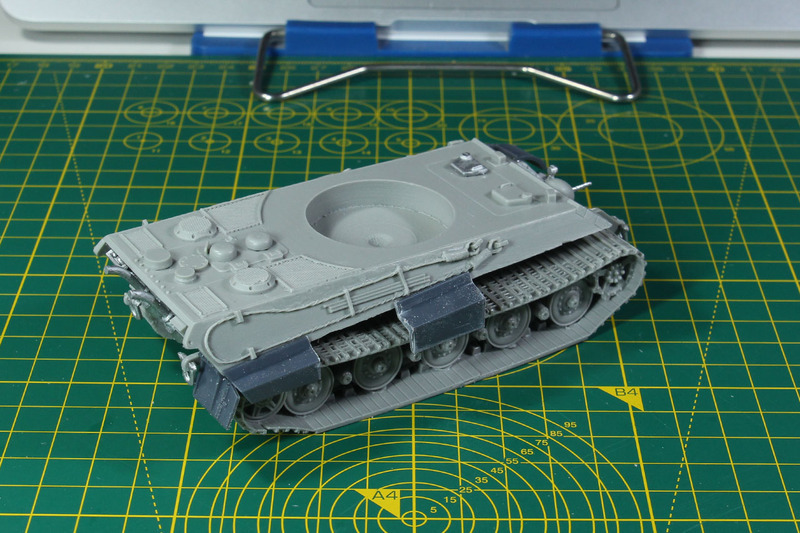 With the recently released plastic kit of the King Tiger this one has a hard competitor, but if you're not a fan of the Zimmerit, this is one of the best choices you can go with. The track guards as a single casted part might be irritating, but the option of gluing 5-6 metal parts with only small gluing surface, will not be a better option, so this is most likely the best way to go. But to be honest, for 28 GBP they could have included a small decal sheet. 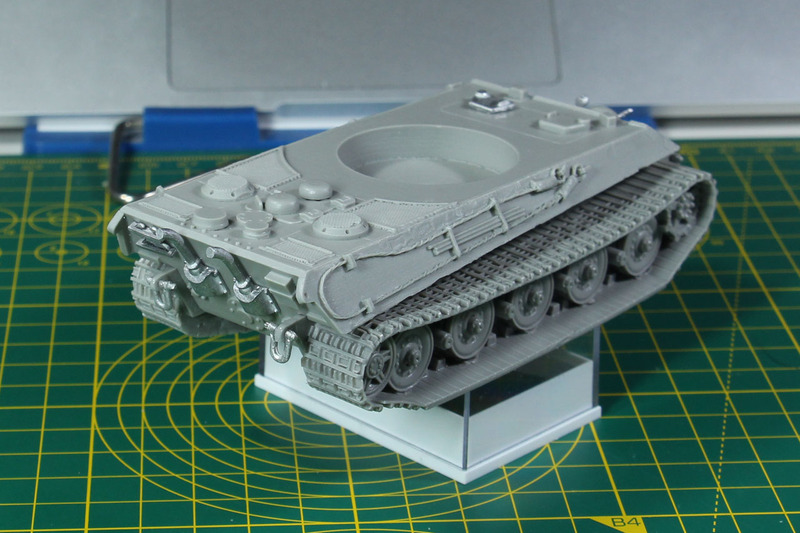 Warlord offers beside this kit several other variants, like the Tiger II with Porsche turret and the Tiger II with Henschel turret and Zimmerit. 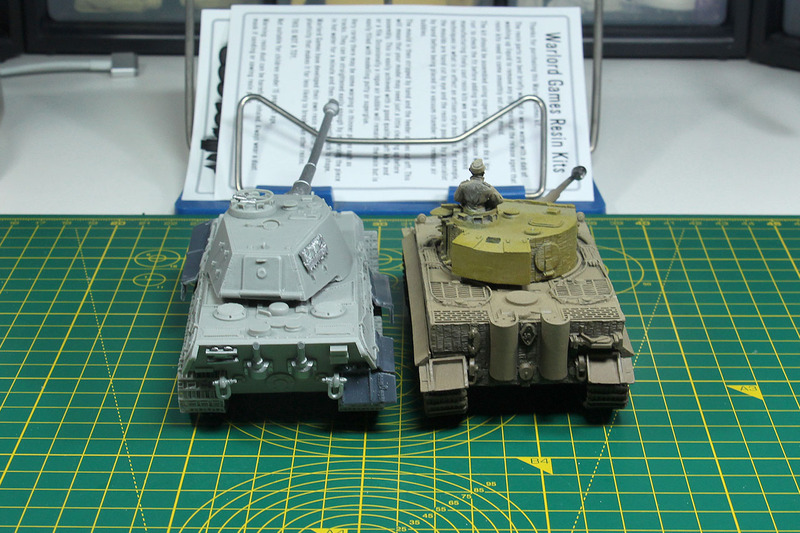 Both are resin kits. 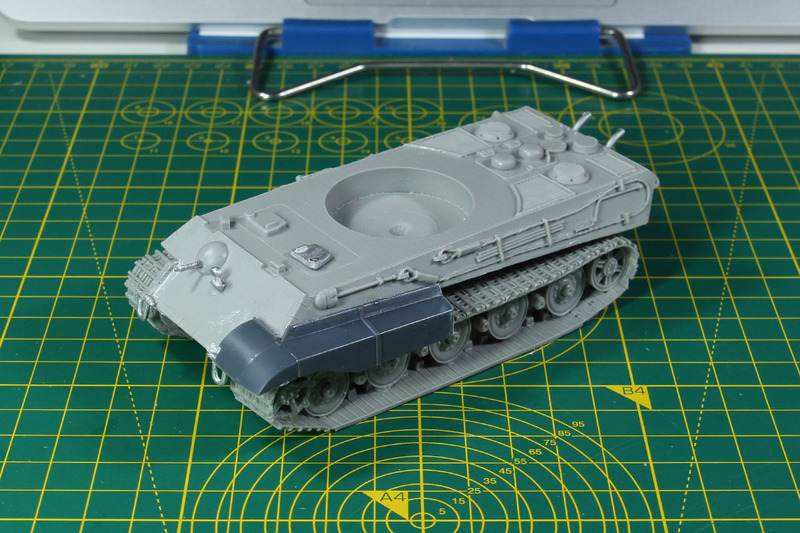 The Zimmerit resin kit is more "realistic" compared to the newer plastic kit, as the Zimmerit is more rugged and unregularly.